Citrus fruits make tangy accompaniments to cooked ham. 4 How Do I Roast a Picnic Ham? 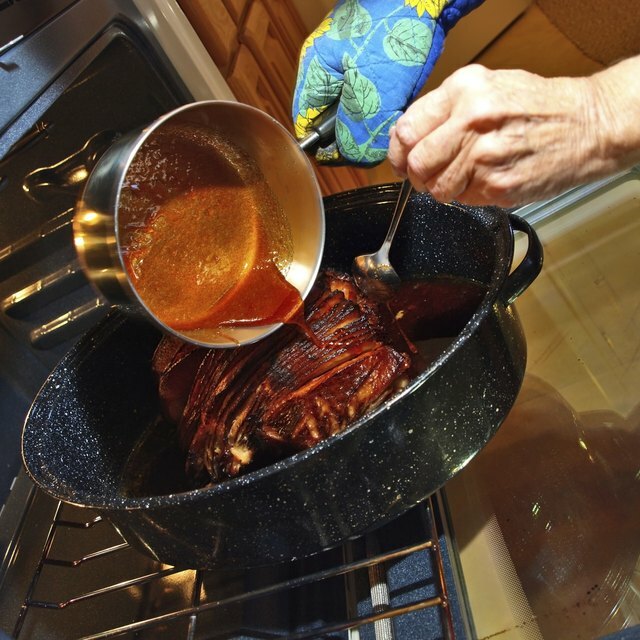 Treat the family to a slow-baked ham by cooking it in a Crock-Pot. Tender, sweet ham doesn't have to just be an Easter Sunday special anymore, requiring hours of cooking time in the oven. Adapt a traditional oven-baked ham recipe by including a little additional liquid for flavor and tenderizing, and a slow-cooked ham will turn into a delicious, fragrant and filling meal, even after a busy day at the office or running errands. Score the fat on top of the ham by making 1/4-inch cuts in a diamond pattern, using a paring knife. Poke whole cloves into the top of the ham in desired pattern. Place the ham into the Crock-Pot. Slowly pour the cider over the ham. Sprinkle the top of the ham with 1/4 to 1/2 cup loose brown sugar. Add a dash of dried mustard. Cover the Crock-Pot. Cook the ham on the low setting for six to eight hours. Substitute cola, ginger ale or lemon-lime soda for the apple cider for a tangy flavor variation.